In a large deep skillet, melt 2 tablespoons of the butter. Season the chicken pieces with salt and pepper, add the pieces to the skillet and cook over high heat, turning occasionally, until browned, about 8 minutes. Add the shallots and morels and cook for 2 minutes. Add the water, cover tightly and simmer over moderately low heat until the chicken is cooked through, about 15 minutes. Meanwhile, in a large saucepan, steam the asparagus over 1 inch of water until crisp-tender, 2 to 3 minutes. Transfer the chicken to a plate. Add the lemon juice and zest to the skillet and cook over high heat for 2 minutes. Swirl the remaining 1 tablespoon of butter into the sauce and season with salt and pepper. 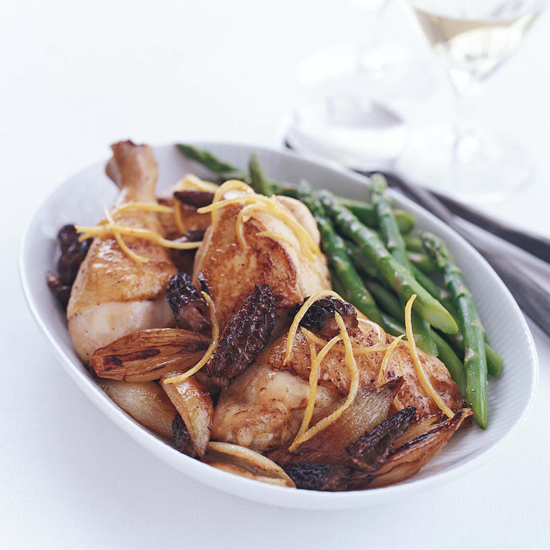 Pour the sauce over the chicken and serve with the asparagus. If fresh morels are unavailable, you can substitute 1/2 ounce dried morels reconstituted in 1 cup of boiling water and drained.